First, I’d like to say that I don’t think Dove is a terrible awful product and you should never use it. I think our soap is far better, but don’t take my word for it! All I’m trying to do is point out where Dove is misleading or not being completely honest. I won’t make any claims that I can’t back up. Now, onto the ad. For this post I’m going to be heavily referencing a lecture given by Dr. Kevin Dunn. Kevin has a PhD in chemistry and has been studying soap specifically for many years. He’s already done the legwork here so instead of re-inventing the wheel I’m going to walk you through what he’s done. 10 seconds into the video: “Soap scum is the combination of soap materials in a normal cleansing bar with the calcium ions that come from hard water”. “Soap scum is the combination of soap materials in a normal cleansing bar with the calcium ions that come from hard water”. 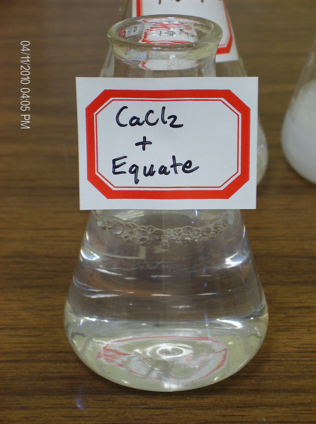 You can see that the soap did in fact form a white substance when mixed with the hard water, while the detergent did not. So far so good. VERDICT: Claim #1 is true. First let’s figure out what’s actually in Dove. 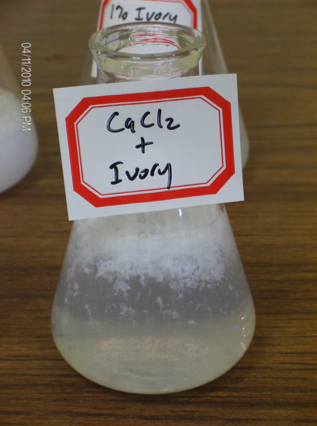 Might as well list out Ivory and Equate for comparison. Again, thanks to Dr. Dunn for breaking these down. Uh Oh. Dove actually contains soap! So how is it fundamentally different from soap? This is a pretty misleading claim. I’ll demonstrate next how dove and soap are not that different with respect to hard water. VERDICT: Claim #2 is at best misleading, and at worst actually false. Hmmmmm, that looks an awful lot like soap scum. That’s because it is. Anything that has soap in it will interact with calcium and form “soap scum”. 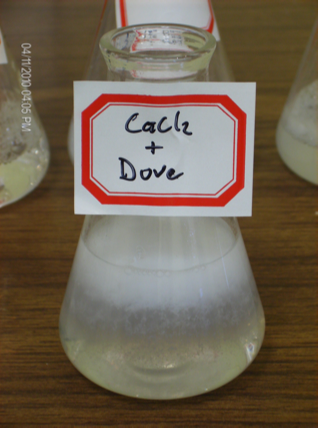 The soap in Dove interacts with the calcium in hard water, the detergent in Dove does not. Notice that the chunks in here are a little smaller than with the Ivory. So technically their claim is accurate. Dove does not interact with calcium in the same exact way as soap. It’s a terribly misleading claim though, because they are implying that Dove doesn’t interact with calcium at all, or that it’s drastically different. In reality it’s nearly the same interaction: it produced soap scum! VERDICT: Claim #3 is absolutely misleading. We’ve already established that Dove creates scum, but does it leave that scum behind on your skin? Does regular soap leave that scum behind on your skin? Dove attempted to answer this by testing how each one rinsed from a mirror. The person conducting the study knows which is Dove and which is soap. Dove is less soluble in water than soap, so the soap is going to be softer after soaking in water. This means it’s likely to leave a thicker film on the mirror than the Dove. Judging which one washed away faster or more completely is subjective. Your skin is not a mirror. Demonstrating the way soap and Dove rinse off a mirror doesn’t really give any valuable insight into how these things rinse off of skin. Dr. Dunn actually improved upon this test by using a double-blind method, using a specific pattern on the mirror to reduce subjectivity, using uniform sample sizes of the different soaps tested, and running the experiment four times with four different groups of people. While his conclusions showed that Dove and Soap require a similar amount of effort to rinse, the test was still pretty subjective, and it still didn’t address how well Dove and Soap rinse from a person’s skin. So, Dr. Dunn came up with an even better experiment. It’s a pretty neat test, and it’s something you can try out yourself, too! Soap is a surfactant. This means it lowers the surface tension of lots of liquids. The one we’re interested in is water. Take a bowl of water and sprinkle pepper evenly over the surface. Now just touch the surface of the water (make sure your hands are completely clean and dry). As you’d expect, nothing happens. Now dry your finger off and swipe your finger across a dry bar of soap. You now have an invisible amount of soap on your skin. Touch the water again, and you’ll see the pepper fly out to the edges of the bowl. This is the visible result of the surfactant nature of soap. What Dr. Dunn did was take four groups of people and test four different kinds of cleansers: A handmade soap (his own blend he calls “Delight”), Dial, Dove, and Ivory. He then conducted a double-blind study using the method above (well, almost, he used a person’s knuckle instead of the finger, to eliminate the chance of soap getting stuck under the fingernail and not rinsing easily). First he tested whether this method was able to detect invisible amounts of soap on your skin. Each of the four groups were able to detect invisible amounts of soap on the skin using this method. Next he ran the experiment again, this time rinsing the hand for 30 seconds under tap water before testing it on the pepper. The results are below. Remember this is a double-blind study, so no group is aware of which sample they are working with and judging. Delight: All four groups were unable to detect any soap remaining on the skin after rinsing. Dial: All four groups were unable to detect any soap remaining on the skin after rinsing. Dove: Groups 2, 3, & 4 were unable to detect any soap remaining on the skin, but group 1 did observe that there was some soap left on the skin. Ivory: All four groups were unable to detect any soap remaining on the skin after rinsing. Dove: Groups 1, 2, & 3 were unable to detect any soap remaining on the skin, but group 4 did observe that there was some soap left on the skin. So, does soap leave scum on your skin? The answer is no. However the results do bring some question as to whether Dove rinses cleanly all the time. It’s not enough to just claim that Dove does not rinse cleanly, though it does make one curious. Some of you might be wondering “aren’t you just testing for soap, not soap scum?” It’s a valid question. The answers is this test does detect soap scum, too. Soap scum actually contains soap, (it also technically is a type of calcium soap) so it will have the same surfactant effect on the peppered water as plain soap. The person judging the experiment is unaware of what they’re judging. Dove is still less water soluble than most soap, but we’re not soaking the bars first, so this should make for a more even comparison. The pepper test is much less subjective. The reaction is highly visible and drastic. It either detects soap & soap scum or it doesn’t. There’s not really any in-between. This test determines the rinsing ability on actual skin, not a mirror. VERDICT: Claim #4 is totally false! Many thanks to Dr. Kevin Dunn for all of his hard work on this and many other projects in the field of soap-making. He’s answered a lot of questions in this field that no one else has tackled. Here are the lecture notes I’ve used for this article. If you are interested in soap-making I highly recommend his book “Scientific Soapmaking”, which can be found over here. Dove is a registered trademark of Unilever NV/PLC. Other brands are registered trademarks of their respective owners. So, what do you think? Let me know in the comments section below! Posted by Hal on Wednesday, June 16th, 2010 at 05:53 and is filed under Around Us, General.